TOP INVESTMENT CHOICE FOR TECH ALUGLASS IN THE U.A.E. There are 10 business units operating under Tech Group of companies based in Ajman with operations spread across the whole UAE, all ISO certified testifying to their unwavering commitment to apply quality management systems. THE Group has recently undergone restructuring to streamline operations with state-of-the-art equipment, and revamping the organization structure to uphold the aggressive growth rate the Group is experiencing. Businesses include ready mix and concrete blocks; petroleum trading; electrical, mechanical and plumbing services; construction and piling works; steel cut and bend; fabrication and re-baring services; sweet water supply; interiors and joinery works…… and of course the renowned glass and aluminium factory which has now enhanced its high-tech machinery park with the addition of ASHTON INDUSTRIAL’s latest edge processing combination, to be delivered early 2017. 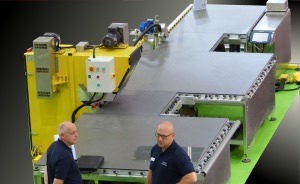 The new ‘combo’ from Ashton’s prestige stable of machinery comprises diamond cross-belt seaming of glass edges – the new Best-of-Both concept that delivers all the benefits of wet seaming without the water or mess – combined with edge deletion of glass surface coatings, and the latest V4 mobile laser marking system, all rolled together into one perfect unit and linked by Ashton’s ‘high float’ air floatation tables for near-effortless handling. 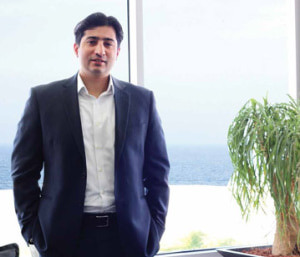 Group CEO Mr Shiraz Hasan [pictured] states on the Tech Group web site, “We have not only exceeded all expectations of our business partners, but have also been able to establish ourselves as one of the most renowned construction groups in the UAE”. Renowned also for the ability to engineer and produce customized and complex windows, door fittings, automatic doors and gates, curtain walls, and partitions, ISO and OHSAS certified Tech AluGlass’ expertise includes all stages of designing, calculating and drawing, production and installation. See this equipment in action by clicking the blue [VIDEO LIBRARY] button on the left, or use this direct link..